At Survivor Series, Charlotte Flair brutally attacked Ronda Rousey after their match. Charlotte Flair heads to the ring. She says she is proud of what she did to Ronda Rousey on Sunday. She will not apologize for what she did. She enjoyed it, and she did it for the women in the SmackDown locker and for the champ. Charlotte fought for Becky Lynch, and she thinks she accomplished the mission that Becky set her on. She made Rousey bow down to the queen. Paige heads to the ring. Paige also enjoyed the beating Charlotte gave to Rousey, but she does remind Charlotte that Rousey said she’s coming for her. Charlotte says if Rousey comes for her, she’ll just beat her up again. Paige is upset that Charlotte laid her hands on referees on Sunday though. As SmackDown GM, Paige fines Charlotte $100,000. The IIconics come out before Charlotte can respond. Peyton Royce and Billie Kay make fun of Charlotte snapping at Survivor Series. When they make it into the ring, Charlotte threatens them both, wondering which of them will be the next Ronda Rousey. The match began with Peyton slowly getting into the ring and quickly rolling back out a few times. This ended when Billie helped Peyton with a distraction, and Peyton started to take control of the match. It went on like that for a little while until Charlotte started to come back. At that point, Billie had seen enough. I think this was good for the IIconics, and helped continue Charlotte’s new attitude. After the match, the IIconics roll Charlotte out of the ring and go for a chair. A crew member takes the chair away, and as the IIconics are distracted, Charlotte gets up and hits them both with a spear. Charlotte proceeds to beat both IIconics onto the announce table ind into the barricade and steps. Rey Mysterio has seen a lot, but he’s never seen anyone like Randy Orton. Rey says that Orton is more sadistic now than he’s ever been. He knows Orton wants to hurt him, but Rey didn’t come back to be a victim. The Miz signs a Blu-ray copy of The Marine 6 for some guy. The Miz is in the ring for Miz TV. He says it was an honor to fight alongside his guest at Survivor Series. His guest tonight is Shane McMahon. Shane heads to the ring. Miz continues to shower Shane with compliments. Shane wonders if Miz, as the host of his talk show, has a question. Miz asks Shane to team up with him. As a tag team. Shane is flattered, but he seems less than excited. Miz was expecting a different reaction. He says that if Shane is really a man, a McMahon, then he will team with Miz in a match right now. Miz brings out two local talents, the Bryant Brothers. This was pretty funny. It was all story line, but it was entertaining. New Day are dressed as pilgrims, and R-Truth is the Gobbledy Gooker. New Day are in the ring, and they are surrounded by food. Xavier Woods quickly says “six and one” before Kofi begins to talk about turkey day. New Day then talks about what they are thankful for. Kofi is thankful for their win last night on the Survivor Series Kickoff show, even if the win wasn’t counted. Woods is thankful for his hard drive so he doesn’t have to delete Spider-Man in order to download Red Dead Redemption 2. Big E is thankful for big, juicy, succulent breasts. Turkey breasts. As Big E begins to lick a turkey, The Bar and Big Show come out and heads towards the ring. This was completely silly, and I loved it. 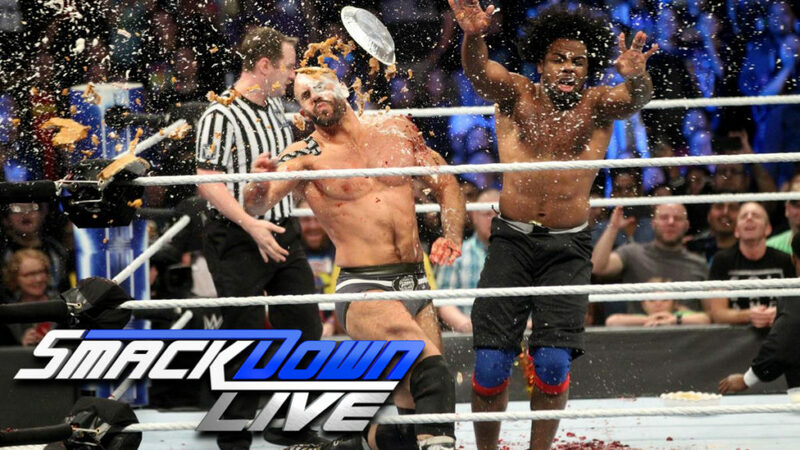 After the match, Cesaro gets bombarded by food thrown by New Day. After every member of New Day takes at least a couple turns throwing food at him, Cesaro collapses in the center of the ring. New Day slides around as they leave and celebrate their victory. To Randy Orton, Rey Mysterio’s mask represents nothing, and it deserves to be destroyed. Orton plans to disgust everyone with what he does to Rey tonight. Asuka and Naomi head to the ring area together. Good match. The story was all about Rose and Deville not getting along, and that played a major role in the finish. Asuka and Naomi looked good together though. I like the team, though I’d like to see them both involved in some story lines at some point. Lars Sullivan is coming soon. Daniel Bryan heads to the ring. Bryan doesn’t expect “these people” to understand, but this explanation is not for them. He says Daniel Bryan performed an act of betrayal, but the betrayal was when he announced his retirement. Bryan learned from his mistake, and he decided to fight. Bryan spent many hours in isolation, and in that isolation he developed a mantra: fight for your dreams, and your dreams will fight for you. And it worked. Bryan returned to the ring, and it was a great moment. But for these people, it was just a moment. They didn’t see the struggle. They didn’t see the people telling Bryan to “move on.” While Bryan was struggling, these idiots were chanting “AJ Styles.” They’re fickle. In his match with AJ Styles, Bryan’s dreams took over. Bryan’s dreams kicks AJ Styles in the balls. Bryan’s dreams made him realize that he doesn’t need these people. They also told him that he didn’t need to beat Lesnar to win, he needed Lesnar to beat the weakness out of Bryan. The old Daniel Bryan is dead. The “yes movement” is dead. All that’s left is “you.” The new Daniel Bryan. The WWE Champion. The only thing that matters now is for Daniel Bryan to never give up on his dreams again. This was a solid match. I liked it. Rey looked strong, but Orton hit a pretty spectacular RKO late in the match. After the match, Orton wraps a chair around Rey’s head and slams him into the ring post. Rey’s mask falls off, and Orton holds it up like a trophy. I liked this show. I’m glad they’re mostly just moving on from Survivor Series (though I’m very happy New Day won’t let it go), and I like the story segments tonight. Bryan’s “explanation” was okay, but everything else was good. Also, I got a lot more enjoyment out of the Thanksgiving Feast Fight than I though I would. Yeah, it was dumb, but I laughed. It definitely put a big smile on my face.